What's going on at RPM? What is going on at Richard Petty Motorsports? For most of this season, the organization has been encircled with rumors and stories of financial problems with most cast aside as long as RPM continued to field four Sprint Cup series teams. 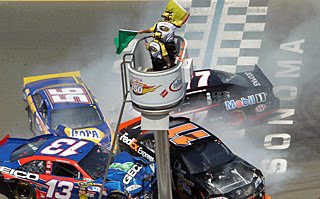 In recent months we’ve learned a four-car team was going to cut down to a two car operation in 2011 featuring two drivers - AJ Allmendinger and Marcos Ambrose - who are talented but have zero Cup wins between them. Kasey Kahne is moving to Red Bull in 2011 and then Hendrick Motorsports in 2012. Paul Menard is moving to Richard Childress Racing next year. Now, five races before the end of the season, more trouble has beset the organization. We learned Kahne had been working on a deal to move to Red Bull as soon as this weekend and late Wednesday night RPM announced it had released Kahne effective immediately. Also Wednesday night, two sources directly associated with RPM told the Observer and ThatsRacin.com the organization had no car or engines from Roush Fenway Racing beyond what’s needed for this weekend. And, no, that’s not a normal occurrence. In fact, with Martinsville cars and engines already ready and none for Talladega to work on, several RPM employees effectively had nothing to work on Wednesday afternoon at the shop, sources said. In the background of all this lies the sale of the Liverpool soccer club, which George Gillett owned along with other investors, for far less money than he had hoped. Gillett is also the majority of RPM. Perhaps we’ll know more when Kahne speaks to the media Friday at Martinsville. But I can tell you, there are many employees at RPM worried about their futures.